Mixed-media artist Sharyn Sowell is known for her amazing paper creations cut with scissors. Her original art can be seen in the British National Portrait Gallery, Children's Hospital Los Angeles and the Waldorf Astoria® Orlando. Sharyn has designed for Hallmark®, Creative Converting® and York® Wall coverings. She has also won the prestigious LOUIE award multiple times. 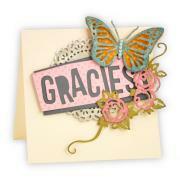 Now her beloved art is available as Sizzix eshape Store downloadable files and as Sizzix dies and embossing folders.